If you’re a photographer or just plain snapshot-happy, you’ve no doubt experienced the dread of sorting through tons of photos, deciding which to keep or trash. I get this feeling every time I return from a vacation or photo shoot, knowing that I’ll need to go through hundreds of images one ... at ... a ... time ... in Photoshop. But with ViewIt, I can simply drop my camera’s photos onto the ViewIt window, view and mark what’s good with just a key press, and copy only those images to my Mac. Beautiful. But that’s not all it does. 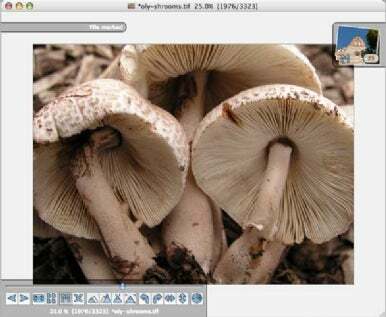 You can also sort images, copy or move photos, e-mail pics, batch convert images to a particular size or file format, print contact sheets, create Web photo galleries, play a slideshow, batch rename files, and more. It does everything you need and then some. The beauty of ViewIt lies in the simplicity of its one-window interface and button controls for viewing; other features are available through menus. But the best part is that you can control most functions with a key press, making viewing and tagging even easier. Just drop one or more photos, folders of images, or even your iPhoto library onto the window and ViewIt quickly makes them available for viewing, displaying JPEG, TIFF, Raw, PSD, PNG, GIF, and other popular image formats (though I had no such luck with my Nikon NEF files). One of my favorite things about ViewIt is that it takes very little effort on my part to determine which photos to save or delete. I simply press the spacebar to start a slideshow and then press the M key on the keyboard to mark each photo I want to keep. If I’m not sure about the quality, I press the spacebar again to pause the slideshow, press the + key to zoom in (and the - key to zoom out), mark it or not, and then restart the slideshow. Once all images have played, I then copy all marked images to my hard drive for editing. My only gripe is that I wish there were a way to designate where contact sheets, Web pages, and converted files get saved, as everything ends up littering my desktop. Still, ViewIt is easy and quick, and eliminates the repetitive strain I often experience when screening photos. I will never go back to my old ways or sorting and sifting photos again.